To Jack, whom we know is now five, Room is his whole world and his only world. Jack has never been Outside, never felt the sun on his face or the breezes blow his hair. We quickly learn Jack and his “Ma” are being held captive in a 12 by 12 foot gardener’s shack that’s been outfitted with electricity, plumbing and basic furniture. Jack is the storyteller and we learn about his world through his innocent eyes. We learn that “Ma” was abducted from her college campus seven years ago at the age of nineteen. We know Jack is her child by their kidnapper, whom they call “Old Nick” because he visits in the night. Now that Jack is five, his mother decides they must try to escape. 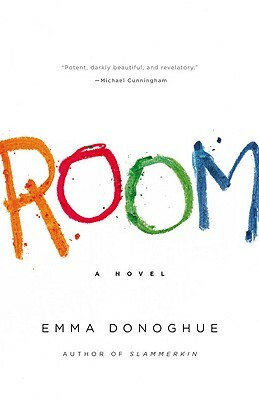 Room was brilliantly penned by Dublin born novelist Emma Donoghue, who wisely chose to tell this story from the viewpoint of a child. By doing that, there is no ability to describe their captivity as anything other than the norm. Jack knows no other existence. Donoghue’s writing captures the essence of the five year old Jack, whose only conversations have been with his mother. He has no reference to other children, no clue about what he is missing, or that his way of life is anything but normal. Donoghue has woven a believable way of life for mother and child in this trapped situation with the mother doing her best to educate, nourish and keep her child strong through games and homemade toys. While I had a little issue with the ease of their escape, it helped move the story forward quickly. I was unwilling to put this book down, except when I absolutely had to. I finished Room in a day and a half. Hypnotic, compelling, spellbinding and fascinating, I highly recommend this book. It’s not always easy to read. The emotional tidal waves created by Donoghue rip into your heart and soul. However, the stunningly believable ending makes the anguish worth while. IF I gave a star rating (but I don’t), I’d give it 5 out of 5 stars. Source: ROOM was purchased by me with my own funds and is a part of my personal library.